POSTED January 31, 2019 2:01 p.m.
LANCASTER — Four weeks ago at the annual Bi-State Classic held in La Crosse, Lancaster wrestling coach Brad Sturmer took full advantage of the opportunity to gather valuable intel on a formable opponent from the Southwest Wisconsin Conference. Little did people know, but Sturmer was already constructing his plan against the defending conference champions from Prairie du Chien, whom the Flying Arrows defeated last Friday night, 45–26, in SWC dual-meet action. As expected, both teams entered Friday night’s dual meet with identical conference records of 4–0, and with Friday night’s win, the Flying Arrows captured this year’s SWC wrestling championship title. Friday night’s match was a well-orchestrated and thought out plan devised by Sturmer weeks in advance, moving wrestlers where he saw fit in order to give his team the best possible chance of coming out victorious. His first move proved to be a good one, and got the Arrows off to a fantastic start Friday night. With the match starting at 182 pounds, Sturmer sent junior Dustin Wolf to the scorers table in place of his usual starter, Troy Klein. Klein, who has wrestled at 182 all season, weighed in at 170 pounds Friday night for the firsts time this season. Wolf (6–2) not only held his own against Prairie du Chien’s Zach Swiggum, but pinned him a time of 3:09 to a resounding roar from the home crowd. As planned, Lancaster did roll, picking up a first-period pin from 195-pound junior Caden Straka (30–5) and a third-period pin from 220-pound senior Cole Zenz (30-4), giving the home team an early 18–0 lead. The Blackhawks scored their first points in the heavyweight match, where Lancaster senior Ben Withey (21–10) wound up on the short end of a 2-1 decision in a hard fought match. “We knew that was going to be a toss up match, and just losing right at the end was kind of heartbreaking,” said coach Sturmer. 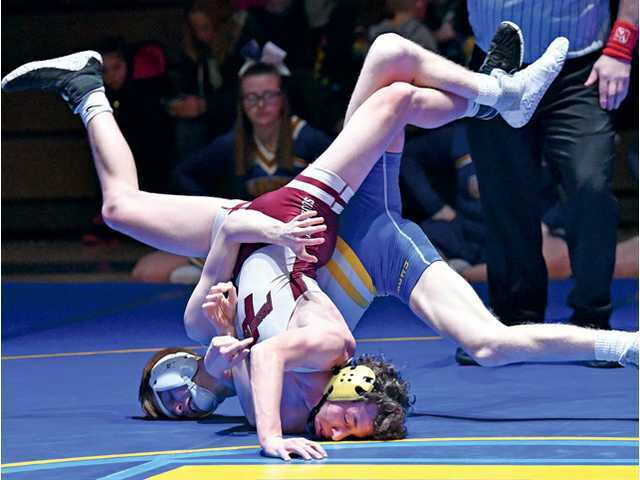 The second of Sturmer’s thought-out-plan worked out as well as his first, where he inserted Michael Ihm (8–3) into the 106-pound match, despite the freshman only wrestling in 10 varsity matches this season. “We’ve been talking to him for three weeks that he was going to wrestle at 106, and that he was going to win. We just put those positive thoughts in his head and the optimism so he didn’t get nervous. It was a big spot for him and he just went out and took care of business rather quickly,” Sturmer added. Ihm wasted little time putting Prairie du Chien’s Nick Mara to his back, collecting six points for his team on a 34-second pin. That left sophomore sensation Remi Bontreger (35–1) to wrestle at 113 pounds, even though he holds the state’s No. 1 ranking in division 3 at 106 pounds. As expected, Prairie du Chien wanted nothing to do with Bontreger, who forfeited the match and gave up six more points to the Arrows, who now held a 30-3 lead. Prairie’s plan to avoid Bontreger didn’t exactly work out as well as the had hoped though, as Matt Rogge was held to a 4-2 decision over Lancaster sophomore Carter Lull (25–7), picking up just three points. At 126 pounds, Lancaster senior Caleb Lucey (19–11) picked up six more points for the Arrows on a third-period pin of Chase Watson with only two seconds remaining in the match. That pin gave Lancaster a commanding 36–6 lead heading into the strength of Prairie’s line up. “That was a match that could have gone either way, so to get the fall there was pretty huge,” Sturmer admitted. In the next four matches, Prairie du Chien collected two pins, one technical fall and a regular decision to pull within 36–26 with only two matches remaining. “They have a string of some pretty decent kids from 132 to 152, but luckily we had a big enough lead at the time that it didn’t cost us too much,” Sturmer said of Prairie’s run. Lancaster’s victory was essentially sealed by 160-pound senior Owen Wolf (21–11), who knew going into his match if he didn’t give up a pin, the Arrows were conference champs. Wolf not only avoided a pin, but he picked up an 8–3 decision over Prairie’s Isaac Avery, giving Lancaster three more points and a 39–26 lead. Wrestling for the first time at 170 pounds, it seemed only fitting that senior Troy Klein (29–5) put the exclamation point on Lancaster’s conference championship, picking up a first-period pin over Tyler Smock with eight-tenths of a second before the first horn. Klein’s pin gave the Arrows what appeared to be a dominating 45–26 victory over the Blackhawks, who on many occasions looked fatigued as their individual matches progressed. “I could tell that we were in better shape at pretty much every weight class,” said coach Sturmer of his squad. On the night, Lancaster collected 45 points on six pins, one forfeit and one regular decision, while giving up 26 points on two pins, one technical fall and three regular decisions. This year’s conference championship is Lancaster first outright title since the 2013–14 season when the Arrows also went 5–0. In 13 seasons under coach Sturmer, the Flying Arrows have accumulated a conference dual meet record of 48–17 and have won five conference titles. 182 - Dustin Wolf (L) pinned Zach Swiggum, 3:09. 195 - Caden Straka (L) pinned Grant Martin, :21. 220 - Cole Zenz (L) pinned Luke Wright, 5:26. 285 - Jerrod Osterkamp (PdC) def. Ben Withey, 2-1. 106 - Michael Ihm (L) pinned Nick Mara, :34. 113 - Remington Bontreger (L) received a forfeit. 120 - Matt Rogge (PdC) def. Carter Lull, 4-2. 126 - Caleb Lucey (L) pinned Chase Watson, 5:58. 132 - Keenan Holley (PdC) pinned Matthew Crosby, 4:32. 138 - Traeton Saint (PdC) pinned Isaac Oyen, 4:44. 145 - Reid Koenig (PdC) def. Logan Schneider, 8-2. 152 - Bradyn Saint (PdC) won by technical fall over Collin Lull, 16-1. 160 - Owen Wolf (L) def. Isaac Avery, 8-3. 170 - Troy Klein (L) pinned Tyler Smock, 1:59. Team standings - 1. Lancaster 5-0; 2. Holmen 4-1; 3. West Salem/Bangor 3-2; 4. Neillsville/Greenwood/Loyal 2-3; T5. Beloit Turner 0-4, Madison East 0-4.